Spring, Here We Go Again! It's that time of year again. The temperatures are warming, the grass is greening, and farmers are itching to get into the fields. A very mild winter has made this year's spring seem to arrive that much earlier. NAAE’s much-used professional networking site, Communities of Practice, http://communities.naae.org got a major upgrade in mid-March. The updates have made the site an even better way to find resources and connect with other agricultural educators. Almost three years ago, I took a leap of faith by embarking on what I hoped was a step forward in agricultural education and a more meaningful and fun education for my students. I also wanted to up my game as an education professional and continue to hone my teaching practices and strategies. Many CASE Institutes will be closing registration this week! Visit case4learning.org to see which Institutes still have openings and sign up! Tim Uhlenkamp and Jeff Eppen teach agriculture at Sibley East High School in Arlington, Minn. Employment opportunities abound for students with a background in soil science and crop production in their area. Uhlenkamp and Eppen decided to re-work the course offerings in their program’s agronomy pathway to make the classes more attractive to students and help them take advantage of local jobs. It's not too late to apply for a NAAE award. The postmark deadline for submitting applications to the NAAE office is May 15, 2012, but many states have their own rules about qualifying for the national competition. Check with your state's agricultural educators' association for details and deadlines, and visit this link to download award details and applications. 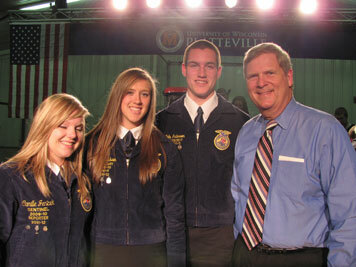 Freedom High School Agriculture students had the opportunity to meet U.S. Secretary of Agriculture Tom Vilsack (pictured) and U.S. Secretary of Education Arne Duncan at the recent town hall meeting about agricultural education at UW-Platteville. To watch the archived webcast of the secretaries' remarks, follow this link.